Before there was any talk of getting the Meppel Jews out of their houses, a young girl, Carla de Leeuw, had already been deported to Westerbork. 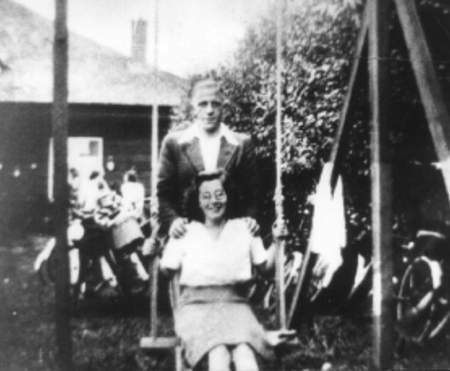 It was not only the end for her, but also for her non-Jewish fiancé Willem Kel. This is an exceptionally sad story. Carla was the daughter of Salomon de Leeuw (born in Blokzijl on the 3rd of July 1895). Salomon de Leeuw was one of the two children of Mozes de Leeuw and Klaartje Brest. Vogeltje a daughter of Abraham van de Rhoer and Matje Glazer (for more information see the Van de Rhoer family). Carla de Leeuw (in the background the Agricultural bank). Mr. and Mrs. de Leeuw had besides Carla two more children, a daughter (Mathilda, born in 1922, who had already moved out of the house before the war and was married to someone called Reens) and a son (Mozes, born on 7 October 1925). Carla and her sister Mathilda  friends and acquaintances knew her by the name of Tilly  went to MULO (high school) Carla did not finish school because she did not take it very seriously; her sister Tilly was much more serious and obtained her diploma. The De Leeuw family lived at 21 Grote Kerkstraat. Sam de Leeuw was a musician (he played in dance hall ‘Stern’ on the Hoofdstraat) and also at home he had a business in musical instruments and sheet music. 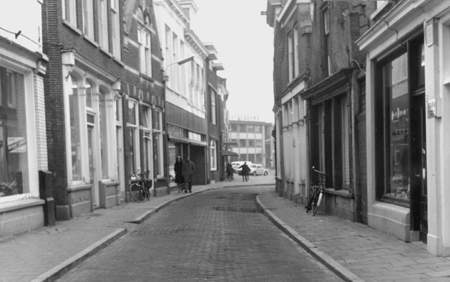 Around 1930 there was no Jewish school in Meppel, which meant that most Jewish children had to attend a state school. That’s the reason that both Willem Kel and Carla de Leeuw were together at the ‘Vledder’ school. It is possible that they met each other there, but their close relationship probably began, when they played matches at the korfball club MKC that they were both members of. Carla de Leeuw and Willem Kel. Willem not only played korfball, he was also keeper in one of the football teams of MSC, the club that the De Leeuw family also favoured. Willem Kel was born on the 21st of April 1919 in Meppel. He lived at 15 Ambonstraat. He was the son of Roelofje Lier and Johannes Kel, cigar maker and street-trader in fancy goods. He had different occupations: baker at J. Bot’s on Zuideinde, shop assistant with the Spijkerman family on Gasgracht. From the 10th of April 1939 until June 1940 he was in the forces and after that he was an independent merchant until he died in 1942. Willem Kel during his compulsory service. Since the beginning of the War Willem Kel had had his doubts about the intentions of the Germans. 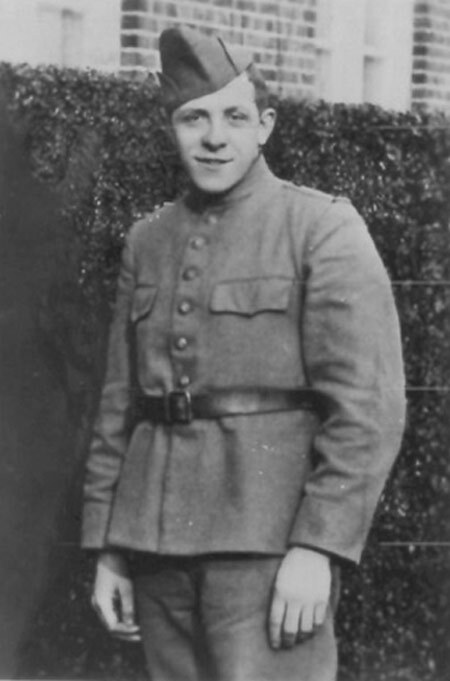 In the May days of 1940, when he was a soldier in the Dutch army, he was made a prisoner of war by the Germans, which was probably the reason he had an irreconcilable resentment against the Germans. It was so bad, that he once had a fight with an NSB member (collaborator) who was selling their newspaper ‘Volk and Vaderland’ (people and country). When the anti-Jewish regulations became more and more perceptible, Willem’s resentment turned into concern about Carla and her family. 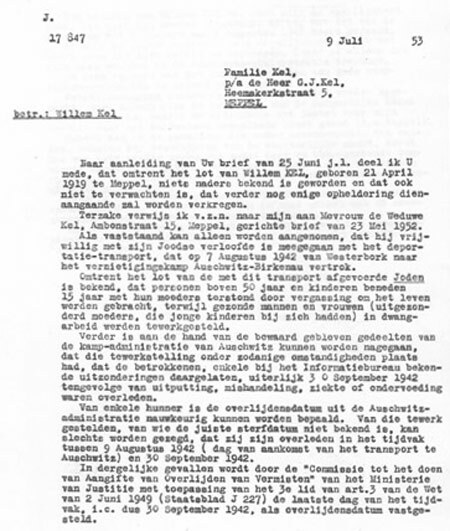 His concern about Carla doubled when on the 8th of June 1942 she left Meppel and moved to Amsterdam, where she got accommodation with relatives. In Amsterdam she could work, unlike in Meppel. Every weekend Willem would take the train to Amsterdam to see his sweetheart. He slept at his sister’s, who also lived in the city. Willem and Carla would walk around Amsterdam, unknown and not troubled by anyone. Willem even pinned the Star of David on his coat to express his solidarity with Carla. Probably, that spring and summer of 1942 was the happiest time in their lives. They were very happy when father De Leeuw put aside his objections against Willem Kel. He wrote a heart-warming letter, giving him permission to marry his daughter. In the middle of this happy period, fate caught up with them. At the end of July Carla had to report to the Zentralstelle für Jüdische Auswanderung (Central office for Jewish Emigration) ‘to be employed in Germany’ as it was called euphemistically. Carla’s fate would be no different from the thousands of other Jews. She went without any objections but with a heavy heart to the Zentralstelle (Central collection point ) and from there to the assembly camp in Westerbork. It probably did not cross her mind to go into hiding. Maybe she was afraid that she would then make things difficult for her parents, brothers and sisters. 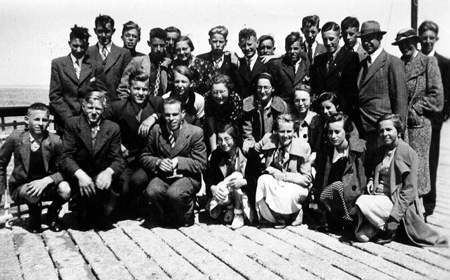 Tilly de Leeuw (middle row, far right) during the school trip of her high school in 1937. Willem Kel was desperate that the girl he wanted to marry (with permission), had disappeared to Westerbork. ‘I won’t abandon her’ he kept repeating many times. He would add a few prophetic words to it: ‘if they take her out of Westerbork, I am going too, I don’t care where to…’ Willem visited Carla in Westerbork. Via an acquaintance who worked there, he could arrange these visits. On the 6th of August, at the end of the weekly market after a quick goodbye to his family (Willem was a market vendor) he cycled to Westerbork. It seems that Carla told him then she would be transported to Poland the next day! What must have gone through their minds? We will never know precisely. What we do know is that Willem sent his bicycle to his parents on Ambonstraat. Apparently he no plans to return. Wearing the Star of David, he waited on the 7th of August at the entrance of the camp amid the Jews. The couple walked together with other Jews from Camp Hooghalen to the place where the train was waiting. Any other trace is missing, except for a paragraph in the Staatscourant (state newspaper) that mentions that Willem Kel died on the 30th of September 1942 in Auschwitz. According to sources Carla died the same day. In the Genealogical Survey, about Jews originating from the north of the Netherlands, the same date of Carla’s death is mentioned. Willem Kel was one of the few Dutchmen who lost his life for being faithful to a Jewish girl. He had nothing to fear from the Germans. He went with Carla to protect her and to be with her. Probably the cynical and sombre young man knew what was coming. Did he know that there was no way out for Carla and did he choose to die with his sweetheart on purpose? 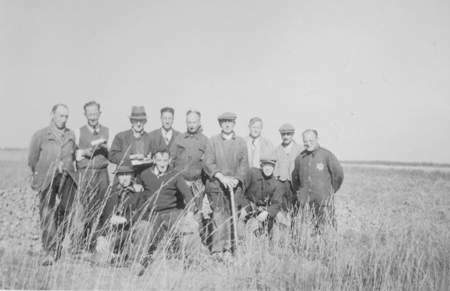 Jewish gentlemen (de Leeuw, Brest, Hartog Goldsteen, Salomon Roos, and his brother Levie) at the labour camp. To complete this tragedy: father and mother de Leeuw died on the 19th of February 1943, sister Mathilda died on the same day as her sister Carla, and Mozes died alone in Auschwitz on the 31st of March 1944. On the 7th of June 1953 it was not yet known when William Kel died in Auschwitz.